Treats & Sweets Day is an annual fundraiser to bring people and pets together. Bakers around the country whip up sweet treats each April to raise money to support the human-animal bond. Founded in 2015, Treats & Sweets Day has raised over $65,000 to register therapy animal teams and bring the love of animals to those in need. If you have questions about Treats & Sweets Day or need assistance with your fundraiser, please email treatsandsweetsday@petpartners.org. 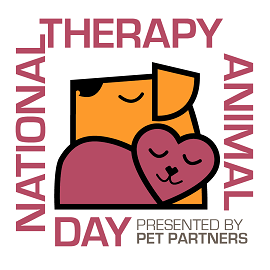 Did you know that April 30th is National Therapy Animal Day™? National Therapy Animal Day was created by Pet Partners to recognize all of the exceptional therapy animals who partner with their human companions to bring comfort and healing to those in need. Therapy animals and their handlers can be found helping people of all ages in a variety of different settings including hospitals, pediatric care units, schools, and nursing homes. Recognize the therapy animals who provide comfort and healing to nearly 3 million people per year. Raise awareness and educate the public about the role therapy animals play in enhancing the health and well-being of humans. Honor the thousands of dedicated handlers (the human members of therapy animal teams) who volunteer their time and compassion during visits. Pet Partners is the national nonprofit leader in demonstrating and promoting positive human-animal interactions, activities and education. Pet Partners has thousands of registered therapy animal teams who are specially trained to lovingly share the healing power of pets with people in need. Pet Partners teams interact with a variety of people including veterans, seniors living with Alzheimer’s, patients in recovery, students facing literacy challenges, people with intellectual or physical disabilities, and those approaching end of life. The impact of these visits is felt over three million times a year. Forty years since the organization’s inception, the science that proves these benefits has become indisputable. Pet Partners’ curriculum and continuing education for licensed instructors, evaluators and handlers remains the gold standard in the field. • Please visit www.petpartners.org for more information on our therapy animal program. • LEARN the Pet Partners Difference. • Find out how to become a therapy animal team with your pet. • Check out our magazine, Interactions.